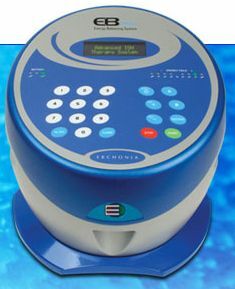 EB-PRO™ Neuromuscular Test On the weekend of September 20 - 21, 2003 at a Seminar sponsored by Erchonia Medical, EB Ion Therapy System and a Computerized Range of Motion System (CRMS) were used in a random trial to prove the effectiveness of the EB foot bath. Doctors were asked to participate in the trial by doing a pre and post-computerized check of muscle strength using the CRMS Musculoskeletal Metrics. The Doctor received a Computerized Comparative Muscle Strength Test (CCMT) procedure that was performed in order to determine asymmetry in muscle strength and to quantify muscle strength loss as noted on the subjective muscle strength test. These muscle strength losses of the upper and/or lumbar extremities indicate neurological facilitation resulting from trauma to the cervical and/or lumbar spine. The Doctor was then given a standard 23 minute Balance treatment. The Doctor was then re-evaluated using the CRMS to determine if any change in strength occurred. Results: The EB System demonstrates the ability to improve Neurologic Facilitation by increasing muscle strength, which is the Gold Standard for any therapeutic device. Muscle Strength testing is an intricate part of any examination as described in the 5th edition of the AMA’s guides to Evaluation of Permanent Impairment. October 7, 2004 Report on the mechanism of action of the EB-PRO with regard to physiological detoxification. As shown here there are 3 ways toxic materials (ions, molecules, clusters of molecules) can become trapped in the matrix. By matrix, I am referring to the extracellular, cytoplasmic, and nuclear matrices that form a continuously interconnected fabric extending throughout the body. It is the operation of this system that is compromised by toxic accumulation. The functioning of virtually all of the physiological systems will be enhanced by toxic removal. In the illustration, (a) refers to mechanical trapping; (b) refers to ionic binding to charges on the matrix surfaces; and (c) refers to hydrophobic & hydrophilic binding (e.g. uncharged molecules adhering to the matrix). The matrix contains other charged molecules, such as other acidic glycosaminoglycans and collagen that are also capable of trapping toxins. I have referred to the hyaluronan gel because it is the dominant component of the matrix and its ion exchange properties are well established. For a review of this topic, see Comper WD, Laurent 1978. Note also that there are some positive charges on the gel, and it will therefore have some capacity to bind anions. Given the physicochemical properties of the gel, there are several ways of releasing toxins bound to the matrix. Changes in charge density and changes in geometry will release both ions or other charged species and toxic compounds trapped in the matrix. There are good reasons that the situation set up by using the EB-PRO should change both local and global charge density on the matrix as well as change its geometry. The changes in charge density will, in turn, affect physiological pH, because the charge network binds hydrogen ions. The science behind the effects of the EB-PRO on detoxification involves research on the properties of the acupuncture meridians and skin, and the ion exchange and water-binding properties of the gel. There are many meridian points on the feet, representing the distal terminals of meridian systems. Hence immersing the feet in the foot bath will enable electrical contact with all of the primary meridians in the body. Adding salt to the water in the foot bath is essential to make the fluid conductive. The meridians reside in the matrix, and have branches that reach into every nook and cranny of the body, even into individual cells as shown in the diagram below. The relationship between meridians and connective tissue has been known for thousands of years and has recently been confirmed by a study published in a peer reviewed scientific journal. A number of studies have shown that the meridians are electrically conductive. Hence the electrical polarities set up by the EB-PRO should be conducted throughout the matrix and thereby change the charge density on a global or systemic scale (by “global” or “systemic” I mean throughout the entire body). The ways changes in charge density bring about toxin release are well established. Again, the research of Laurent and colleagues in Sweden is key. The geometry of the gel and its water and ion binding characteristics are dependent on the mutual attraction and repulsion of the charges on the gel matrix. Change charge density, and you will change the geometry, releasing trapped molecules. Changing the local charge configuration will release material that is ionically bound. The final link in the process is to describe how toxins released by the above process can find their way into the footbath. Again, research on the meridians has shown that they are capable of acting as channels for the transport or diffusion of various molecules. Radiographic studies using scintiphotography showed that a radioactive dye, technetium-99, injected into a meridian, flow linearly along the meridian pathway and well up into small circles at the classical acupuncture. The electrical polarities set up by the EB-PRO should cause toxin molecules to migrate along the meridians to the bottoms of the feet by a process akin to electrophoresis. This process is defined as the migration of charged colloidal particles or molecules through a solution under the influence of an applied electric field. The meridians are one of several pathways for toxins released from the matrix to exit the body. Capillaries and lymphatic channels will also pick up toxins and carry them to the liver and kidneys, where they will be detoxified and/or excreted. There are also spaces within the skin that can support the flow of materials released from the matrix. For example, the innermost layer of the skin, the corium [dermis] is relatively rich in intercellular spaces through which ions and other solutes may pass freely. Its ready permeability to ions has been observed by Papa and Kligman who found that the cationic dye, methylene blue, when driven into the sweat gland by strong electrical currents, migrates down the duct to the level of the dermis where it passes laterally (horizontally). Comper WD, Laurent TC, 1978. Physiological function of connective tissue polysaccharides. Physiol Rev. Jan;58(1):255-315. Matsumoto K Birch S 1988. Hara diagnosis: Reflections on the sea. Redwing Book Company, Brookline, MA, 484 pages. Langevin HM, Yandow, JA 2002. Relationship of acupuncture points and meridians to connective tissue planes. The Anatomical Record 269:257-265. Becker, R., M. Reichmanis and A. Marino. Electrophysiological correlates of acupuncture points and meridians. Psychoenergetic Systems 1: 105, 1976; Motoyama, H. Electrophysiological and preliminary biochemical studies of skin properties in relation to the acupuncture meridian. International Association for Religion and Parapsychology 6: 1-36, 1980; Reichmannis, M., A.A. Marion and R.O. Becker. D.C. skin conductance variation at acupuncture loci. American Journal of Chinese Medicine 4: 69-72, 1976; Reihsner, R., B. Balogh and E.J. Menzel. Two-dimensional elastic properties of human skin in terms of an incremental model at the in vivo configuration. Med. Eng. Phy. 17: 304-313, 1995; Tiller, W.A, What do electrodermal diagnostic acupuncture instruments really measure. American Journal of Acupuncture 15(1), 18-23, 1987. Darras JC, de Vernejoul P, Albarede P, et al. Nuclear medicine investigation of transmission of acupuncture information. Acupuncture Med. 1993; 11:22-28. C. M. Papa and A. M. Kligman, J. Invest. Dermatol., P9, 139 (1962). The contents of this page/brochure are for informational purposes only. Erchonia® makes no claims as to any medical benefit of the EB-Pro™ and EB-305™ units.